One of the most prominent names in the college admissions cheating scandal, known as Operation Varsity Blues, is actress Felicity Huffman. She was recently arrested for "donating" $15,000 to the scam's mastermind William Singer's company in exchange for getting her eldest daughter into college. She is charged with mail fraud and faces up to five years in prison. She was released on $1 million bail. During her court appearance, it was revealed that Huffman and her husband, actor William H. Macy, have amassed a real estate portfolio that is valued at $20 million. "My little cabin actually started as three cabins. They were part of a motel called Toy Town, and they sat out on Route 2 until Daphne, the woman I bought the place from, moved them. I hooked them together, so although the cabin is only about 400 square feet, it has about 12 roof lines. On one side of the largest cabin there was a little door that opened to a fuse box. I didn't have electricity, but I left the door there. One summer, for no good reason, I opened the door and a writhing mass of garter snakes fell out all over my feet. I jumped so high I left one of my shoes." Director Paul Thomas Anderson wrote the script for Magnolia while he was staying at Macy's cabin. In fact, the film was inspired by those snakes as once Anderson saw one, he was too scared to go outside. The Macy-Huffman real estate portfolio also includes a 27-acre property in Little Woody Creek, just north of Aspen, Colorado. It is the site of Huffman's childhood home and where she and Macy were married. The original house that Huffman grew up in had to be demolished because it was not up to code. The couple had it rebuilt with modern upgrades and the renovated home was the subject of a 2018 feature in Architectural Digest. The "old-new house", as the couple calls it, is the same basic structure as the one Huffman grew up in, just bigger and 100 feet to the left of its original location. Each of the five bedrooms has its own bathroom. Growing up, Huffman shared one bathroom with her six sisters. The property is worth more than $10 million. This wasn't the couple's first time in Architectural Digest. In 2000, the magazine profiled the completed restoration of the couple's Hancock Park area of Los Angeles home. They bought the 1920s Mediterranean style home after getting married in 1997. They also own a small home in the Los Angeles suburb of Northridge. When Desperate Housewives ended, Huffman and Macy purchased a 4,566 square foot, five bedroom, three bathroom home in the Outpost Estate neighborhood in Los Angeles. Marilyn Monroe and Gore Vidal once lived there. Macy and Huffman lived next door at the time. They bought the house next door to their Hollywood Hills home, which gave them a three acre compound with two main houses. Huffman and Macy's home is valued at $4 million. The combined two lot compound comes in at just under $8 million. Huffman is facing charges related to the $15,000 she "donated" to a fake charity in exchange for getting her daughter a higher SAT score. Huffman had the site where her daughter took the SAT changed to allow her more time to take the test that was then proctored by someone in on the scam. 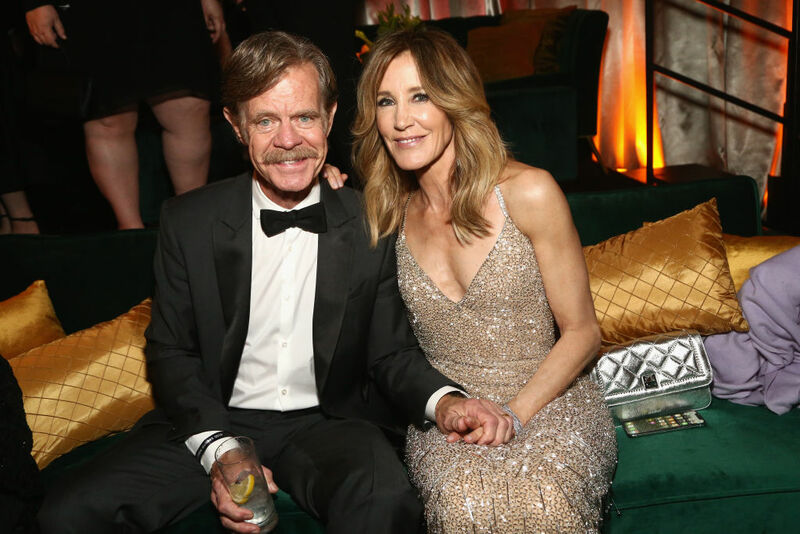 Thus far William H. Macy has not been charged in the college admissions cheating scandal.